Ashley: Get your eels ready and make those cherries jubilant: “The Innkeepers” is fraught with Frasier-ian shenanigans when the Brothers Crane decide to buy and run a restaurant. I’m very pleased I get to start this week’s team-up review because “The Innkeepers” is my favorite episode of the entire series (squee!). There is no other episode that I quote more and even though I’ve easily watched it over 30 times, it still makes me laugh so hard I can’t breathe. It’s basically a go-to episode: whenever I’m having a bad day it’s something that puts a smile on my face. And it does so because it’s a perfect television episode, in my opinion. It includes nearly the entire cast (and in positions they wouldn’t normally find themselves), the dialogue is witty, and everything they say and do makes the situation more comical. This episode seems like one of the many episodes that would translate well to the stage (what do you think, Andrew?). Seeing as it only has two sets and the third act basically runs on real-time, I think this episode would be great on stage. Hell, I’ll be Daphne and slam an eel on a countertop. The venture into food service for Niles and Frasier is an absolute disaster. And it’s so much fun to watch. On the other end of the scale, I’ve only seen “Dark Victory” a few times. Seeing as I own the series on DVD, I usually skip this episode after “The Innkeepers.” One of the things I like about this episode is the focus on Roz, more importantly her being from Wisconsin. Her Dairy State upbringing is apart of the personality of her character throughout the series. But, much like “The Innkeepers,” this episode would translate well to the stage because it basically has two sets: the radio station and Frasier’s apartment. A blackout forces the group together, aside from Martin’s birthday, and Roz opens up about why, though homesick, doesn’t want to go back to Wisconsin for her family reunion. Similarly, Daphne opens up why she stays with the Cranes despite having enough money to be on her own. I love this episode because the characters are thankful for their current lifestyles and it’s wonderfully uplifting. Andrew: Frasier is rooted in farce, and “The Innkeepers” about as farcical as you can get, so I agree that it could easily be staged. “The Innkeepers” is also one of my three favorite episodes; it expertly blends high-brow (Frasier and Niles’ snooty plans to make the restaurant exclusive) and low-brow (injuries and explosions) comedy and is endlessly quotable. It also serves to point out how we often romanticize certain careers and ways of life, helped in no small part by their depiction in media. Frasier and Niles have a very myopic and rosy view of the restaurant business; to them, being a restaurateur is to live the life of luxury. Owners of four-star restaurants get to use their position to exert social power and express their knowledge of food and fine wine. They forget that working in a restaurant includes, you know, work. And as owners, every problem the restaurant faces will be their problem. This being Frasier, it’s not long before the problems start piling up, both as a result of the brothers’ naiveté and of the fact that this is life and things go wrong. I’ve seen “Dark Victory” before, but I’d forgotten much of it, including how thematically interesting it is. After a long week, Frasier wants to unwind with his friends and family and celebrate Martin’s birthday, but the party happens to fall on a day when everyone is in a foul mood. Frasier spends most of the night playing referee and peacemaker, trying to enforce enjoyment and merriment, but is met with resistance and scorn. Over the course of the night, he is able to help lighten their moods through psychiatric advice. Frasier is extremely passionate about psychiatry and wants his family and friends to be happy, so the fact that, by the end of the episode, everyone has made up and is in a festive mood should bring him happiness. 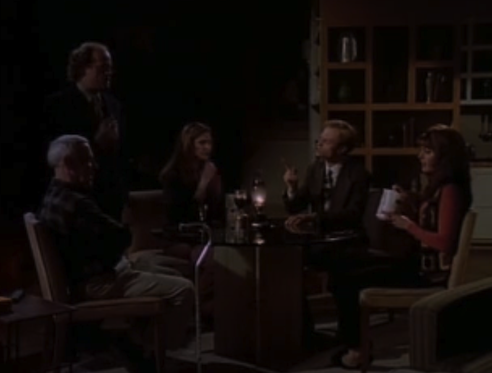 Instead, Frasier ends up in a foul mood himself, feeling that his friends and family are ungrateful because they would rather spend time at a different party than at the one he threw. He wants everyone to be happy, but he also wants happiness on his terms. To be fair, it would hurt knowing that your loved ones would choose someone else’s party over your own. On the other hand, you can’t dictate happiness, and after the mood in Frasier’s apartment, it stands to reason that everyone would want a change of scenery. Ashley, what did Frasier’s climactic speech say to you about him? Ashley: It’s easy for Niles and Frasier to put money into a venture like a restaurant without realizing they need to work in it. How did a restaurant that size have just two waiters, one bartender, and two managers who hobnobbed the whole night? For anyone who’s worked in a restaurant that certainly isn’t enough people. 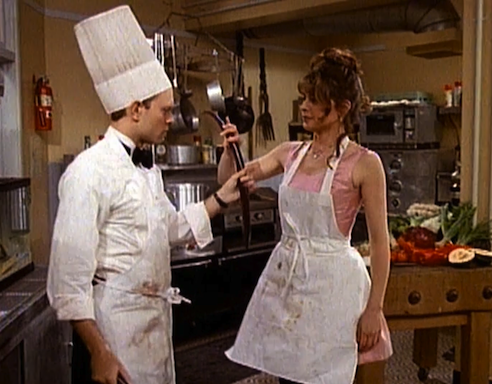 However, it does set up the episode for Roz to be the only waitress, Martin as the bartender, and Niles and Daphne in the kitchen (and I think they made a pretty great team together in the kitchen). Martin even tells them in the beginning that owning a restaurant often doesn’t work, and if you’re going to look at success rates for restaurants, he’s totally right. Daphne further drives home the point that owning a restaurant is hard work, even a little tearoom. Naturally, Niles and Frasier don’t listen because they just see the glamour in owning a restaurant. Sadly, I can’t understand that. I love food, but no thanks, don’t want to own/run a restaurant. I liked Frasier’s speech at the end of “Dark Victory.” He has a point, in my opinion. Martin’s sweeping statement of “he’s always been that way” in regards to being a party pooper is unfair. Frasier brought everyone together to make them feel better. He’s a psychiatrist and one of his skills as one is to help people through their issues and maybe find a solution to them, maybe even help them find happiness in some way. Frasier is pompous and overbearing at times but he does care, especially about the people most important in his life, which includes Martin, Niles, Roz, and Daphne. Them leaving him to go to another party (I liked the “Never Have I Ever” game variation with the pennies) as they fail to recognize his efforts to bring them closer together is unfair. He had every right to say what he said. Andrew: Leaving Frasier’s party was a bit ungrateful on the part of his friends and family, but Frasier conveniently forgot what he told Niles earlier to help make him feel better. Sometimes people have to take their own paths. Niles’ issue with Frasier was that when one of his patients called in to Frasier’s show, she told him that she didn’t think she was progressing in therapy, so Frasier suggested she end the relationship. 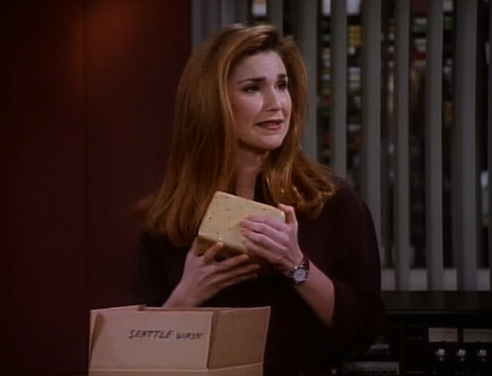 Frasier was not responsible for Niles losing a client, but he helped her realize that she had to make a decision. He helped her see what she needed. Later, at the party, Frasier helped his friends and family see what they needed to be happier. He didn’t make them happy, he gave them clarity to see what they already knew but refused to admit themselves, and once he had done so, it was up to them to figure out how to make themselves happy. He should have been proud of his success, but instead he griped about how they didn’t achieve happiness in the precise manner he wanted. I understand the frustration, but if he could let things go, and recognize that he got what he wanted in a way other than how he intended, he’d be a lot happier. Ashley: Frasier being the pompous and stubborn man that he is it doesn’t surprise me how he reacted. “Letting go” really isn’t in his nature (I get it, really, I understand this completely). He didn’t realize that it was Niles’ patient that was stagnant, and I imagine, if it had come to light in conversation, he might have (maybe) convinced her to stay with Niles because he knows he’s a brilliant psychiatrist. As far as season finales, this one wasn’t the normal cliffhanger which I like actually. It was different in the sense that it made the audience think about their own current life situations. It certainly made me think when I rewatched it. Instead of setting up the third season for some resolution to a conflict it left the audience with a mulling point. The Frasier audience could go into the summer break with a sense of completion and start season three with something different.